Mr Janjetović has also been the non-residential Ambassador to a number of countries during his career including, Sri Lanka, Bangladesh, Nepal, Belarus, Armenia, Uzbekistan, Kyrgyzstan, Kazakhstan, Ukraine and Moldova. 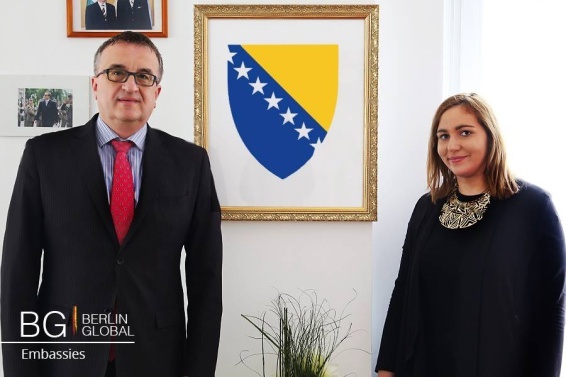 Ambassador Janjetović also has experience working in the Ministry of Internal Affairs, Court , Non Governmental Organizations and multinational companies. Being an Ambassador previously in the among others, in which position do you think you gained the most experience or faced some of the most difficult challenges? All diplomatic work is equally special and challenging. In diplomacy every word and destination is important. We can not divide them as important and less important. The Russian Federation is a politically and economically important country, and plays a significant role on the international scene. The Russian Federation, the USA and the EU have worked together in the fight against terrorism, piracy, organized crime, the fight against drug trafficking, white collar crimes etc. and I perceive this world a safer place when the main players act together. The threat of terrorism is too high in Europe as it is in the other parts of the world, so we need unity to fight and to win against terror. Russia is on the rise to become again the new superpower. It is a unique experience to live and work as a diplomat in India and the Russian Federation. After my diplomatic work in India I came to the Russian Federation and it was a big challenge due to the culture, climate, and other differences and I found it very interesting to observe and to understand the modern world from different angles. To define processes, to evaluate the political and economic development of the world, and the Western Balkans Countries and Bosnia and Herzegovina’s position in the modern world, and in the EU. How we could use better our potentials (human, natural, geographical and others), and what needs to be done in order to give our children a better place to live, than the one we have now. Diplomacy is a unique profession which can give you the answers to all these questions, whether you think locally, regional or globally. My family and I enjoyed the wonders of India, the warm people, unusual regions and food, the dynamic diplomatic life and celebrated the two main Indian festivals Diwali and Holi with our friends from India and other parts of the world. Not so long after, from warm India we arrived to the big and cold Russia, where we made new life stories and experiences. Working as a diplomat in one of the strongest countries in the world, allowed me to learn and grow myself, especially being there in the time when the USA and the Russian Federation reset their relations and promised a safer and nicer world. I suppose that the Diplomatic career and experience I got in Moscow helped me the most in my career. It allowed me to better understand the events and opportunities from a different angle and foresee the future processes in the world. After Russia we went to Hungary and for the first time, we had an incredible opportunity to be just 5 hours away from home. My main tasks in Budapest were to monitor the flows of the Regional integration processes within the framework of the Visegrad Group V4, help BiH on its path towards the EU and the region, and to work on stronger political, economic and cultural ties. Your Excellency, you spent a lot of time in India. Did you learn anything there that you always keep in mind, perhaps something from their culture? India was my first destination, my whole family, my wife Renata and my daughter Nina went there to live and even my son Severin was born there in 2005. On the day when he was born it was 48 degrees Celsius, so we also contributed to the natality there! After a few months there I was worried; what if I struggle with the obligations and can't manage everything. It was a different way of life, food, climate, even to drive the car was different- it was on the opposite side of the road! India and Pakistan were at that time (June, 2002) in a very serious conflict as well. When my plane landed at the Indira Gandhi International Airport in New Delhi all other planes took off because the countries were asking their diplomats to return home because of the war threat and I was among the very few who arrived. The warmth of the people left the biggest impression on me. I loved to go to the Eastern part of New Delhi, to hang out with all the people and get to know the culture. I tried to understand better the spiritual side of India, a 5000 year old civilization and I learned yoga and breathing exercises, which to this day I still do and it has helped me a lot through my personal and professional life. After having served as an Ambassador in these very different countries, now you are in Germany. What are your impressions here? It is a great honor to work as an Ambassador of Bosnia and Herzegovina in the Republic of Germany, especially in this moment when Germany offers great and honest help to BiH and the whole region of the Western Balkans. I will use this opportunity to thank the Government and the citizens of Germany for the understanding and the help given, with an honest hope that Bosnia and Herzegovina will be able to use this help and one day, become an EU member state. We are on a way of great reforms, we handed in the application for membership which should be accepted soon, after which the long road towards the actual membership will start. The EU should be considered as a wave of change which will come to our country, the change in our everyday life, behavior and obligations which will help us in economic and social reforms. The help of Germany is very crucial for us, also because of the 160,000 people we have living across Germany who love this country and consider it as their own. 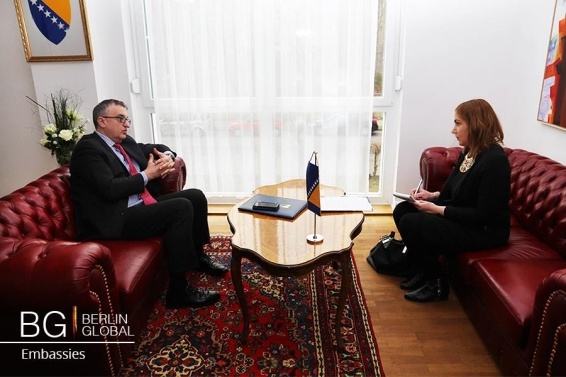 Bilateral relations between Germany and Bosnia and Herzegovina are ascending, which is confirmed by bilateral visits of the highest level, starting from the visit of H.E. Chancellor Angela Merkel to Sarajevo last year in July, to the visit of the Minister of Foreign Affairs of BiH to Germany two times in a few months, and at last we have great expectations for the visit of the BiH Presidency in June this year. BiH expects the approval of its application for the EU membership and I am sure that from that moment on a new era will start for Bosnia and Herzegovina; intensified democratization of the country and the society, and overall better life for everyone in BiH. How is the Embassy promoting Bosnian and Herzegovinian culture in Germany? The aspect of bilateral relations is very important because if there is no economy then there is no strong basis from which we could promote the culture. The task of diplomacy is that it displays the cultural field of the country, but we have to do more in this area. The film industry of Bosnia and Herzegovina has a lot of talented young people from directors to producers and actors. At this year's Berlinale Danis Tanovic received a Silver Bear for the film Death in Sarajevo. We plan to organize the first film festival of Bosnian film in Berlin, to be able to celebrate our film artists. There is room for improvement, Sarajevo is the capital that is known, but other cities should also be displayed better. Bosnia and Herzegovina has a small area full of everything from culture and language, it is the heart of Europe. Through the TRADUKI literary network in Berlin we show the literature of Bosnia and Herzegovina. Cultural heritage should be shown because it is built through inheritance. When we promote our culture we also strengthen our political and economic relations. Finally, Your Excellency, for what reasons did you decide to become a diplomat? What advice would you give young people today who are thinking about entering into the diplomatic field? I feel that the character of a person defines his/her profession, taken that the person is able to choose to do what he or she truly loves. My first and, lets say, unrealized professional love is law, partly because of the continuing war at that time in BiH, and partly because I did tons of other work until I eventually found myself in diplomacy, and have stayed in it for more than 10 years already. I am a graduated lawyer with a Masters in Economy and currently I’m pursuing a PHD in Economic Science on the subject of the EU and the Eurasian Union. All this goes along with diplomacy and helps it become stronger and more successful. I advise young people not to set limits to knowledge and success. Ones profession must be cherished and full of hard work. The result of the success comes by itself. Without patience there is no true success in life.